Northern populations of the Texas Horned Lizard have experienced significant decline over recent decades. Disease has played a significant role in the decline of other reptiles and amphibians and little is known right now about the common pathogens affecting the Texas Horned Lizard. The aim of my project is to identify the common pathogens affecting this species and to determine whether there may be a risk of introducing foreign pathogens during translocation efforts for conservation purposes. The Fort Worth Zoo has worked closely with the Texas Parks and Wildlife Department to develop a captive breeding program that has been successful in releasing captive hatched lizards to help declining populations. Disease has played a critical role in the decline of reptiles and amphibians around the world. Viral and fungal pathogens have threatened many reptile and amphibian species worldwide. The reintroduction of captive tortoises for conservation has spread upper respiratory diseases to wild endangered populations. There is little information on the pathogens Texas Horned Lizards carry and whether any pathogens may be contributing to their decline or whether captive reintroduction or translocation programs may be introducing additional threats to populations already at risk. The Texas Horned Lizard is an iconic species and is endeared by the state and the subject of community conservation efforts like the Texas Horned Lizard Watch. Many institutions, like the Fort Worth Zoo and the Texas Parks and Wildlife Department have developed multiple programs to conserve the threatened populations of this species. Understanding the pathogens these reptiles carry will allow us to understand the threats that they are facing and will provide conservation officials vital information to prevent the spread of disease to threatened populations. The goals of this project are to determine the pathogen profile for three different populations of Texas Horned Lizards selected for a translocation project by Texas Parks and Wildlife. To determine the prevalence of internal and external parasites, Salmonella, Adenovirus, and Herpesvirus. To evaluate what risk, if any, translocation or captive introduction programs may have of introducing foreign pathogens to threatened populations. The funds requested are to purchase the necessary sampling items including glass slides, swabs, syringes, needles, and sterile tubes. These funds will also allow us to send our samples to the appropriate laboratories for Salmonella culture and to detect viral particles via polymerase chain reaction (PCR). PCR is an expensive technique, but is the only reliable way to detect viral antigens without more invasive procedures that we want to avoid because of the threatened nature of these populations. I have been passionate about science and biology for as long as I can remember. I remember reading countless books about animals and watching endless nature documentaries when I was younger. Now I am fortunate enough to be on the other end of those dreams. I am currently a second year veterinary student at the Texas A&M College of Veterinary Medicine and Biomedical Sciences. I have been privileged to conduct research in Panama and Costa Rica. I have also been forunate to have been able to work with zoo and aquarium veterinarians throughout the United States and with wildlife veterinarians in South Africa. Now I have the unique opportunity as a Merial Veterinary Scholar for Texas A&M to conduct research on an amazing local reptile species in collaboration with both the Fort Worth Zoo and the Texas Parks and Wildlife Department. This project in particular combines my love of medicine with my passion for conservation and I look forward to what we can discover as we strive to protect this iconic species. I will be working under the supervision of Dr. Carlos Sanchez. 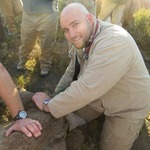 Dr. Sanchez is the Senior Associate Veterinarian at the Fort Worth Zoo and has over 18 years experience as a zoo and wildlife veterinarian and has been involved in conservation projects in different parts of the world. He is now leading the disease screening of wild populations of this charismatic animal.